A small cannonball weighing 5-kg is launched vertically in the air with an initial kinetic energy of 500 joules. How high will the cannonball travel above the launch point? Correct Answer: B. 10 m.
KE -> PE -> KE = PE -> KE = mgh -> h = KE/mg = 500 J / (5 kg)(10 N/kg) = 10 m.
A force of 1 minion can cause 1 gram to accelerate at 1 cm/s2. How many newtons are equivalent to 1 minion? A hollow rubber ball, whose volume is 3 x 10-3m3 and has a mass of 1.0 kg) is held by a 1-meter-long string attached to the bottom of a large container of water. What is the tension in the string? A horse accelerates uniformly from 0 to 20 mi/h in 2 seconds. What is the acceleration? The centripetal force of the car is mv2/r, where m is the car’s mass, v is the velocity, and r is the radius of the circular track. If we double the radius while keeping everything else uniform, the centripetal force will be halved because they are inversely proportional. A construction worker uses a crane to vertically lift an object weighing 2000 N to the top of a platform at a constant rate. If it takes 30 seconds to lift the object 150 meters, what is the rate of energy consumed by the motor in the crane? Correct Answer: C. 10 kW. We can use the equation Power = Force*velocity to solve this problem. The object moves 150 meters in 30 seconds, so the velocity must be (150m/30s) = 5 m/s. Plugging this back into the original equation of P = Fv, then P = (2000 N)(5 m/s) = 10 kW. Water moves through a turbine in a dam, causing it to turn. The force of the water is 300 N, and the radius of the wheel is 20 m. What is the torque around the center of the wheel? Assuming that the water stream is tangent to the wheel, it will be perpendicular to the radius vector at the point of contact. Therefore, the torque of the force of the water stream is Torque = r*F = (20m)(300 N) = 6000 N-m. Which of the following statements regarding electric current is true? A. Electric current will only flow from a higher potential to a lower potential. B. Electric current will only flow from a lower potential to a higher potential. C. Oscillate between potentials of higher and lower energy. Correct Answer: A. Electric current will only flow from a high potential to a lower potential. Electric current moves in the direction positive charges move in. Therefore, the electric flow of current flows from the point of higher potential to lower potential, similar to how water falls from the top of the waterfall to the bottom. Which expression gives the acceleration of a 1kg mass on a frictionless inclined plane at 30o to the horizon, given that g = 9.8 m/s2? 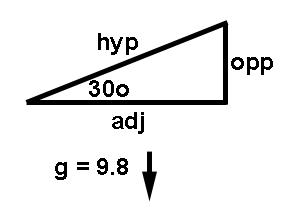 Gravity is calculated from the vertical component of the force on the mass: sin theta = opposite/hypotenuse. What happens to the kinetic energy of a race car if its speed is tripled? A. The kinetic energy increases 3 times its original value. B. The kinetic energy increases 4.5 times its original value. C. The kinetic energy increases 6 times its original value. D. The kinetic energy increases 9 times its original value. Correct Answer: D. The kinetic energy increases to 9 times its original value. Kinetic energy is: KE = (1/2)mv2. The kinetic energy is directly proportional to the square of the velocity (or speed). If the speed is multiplied by 3 (tripled), the KE must be multiplied by 32 = 9. Sidenote, race car spelled backwards is still race car. If you’re buying books for class or in preparation for the MCAT, sign up for Amazon Student. You can get up to 90% used textbooks, free two-day shipping, and be entered into a Kindle Fire HD giveaway. Offer ends soon, join free now.